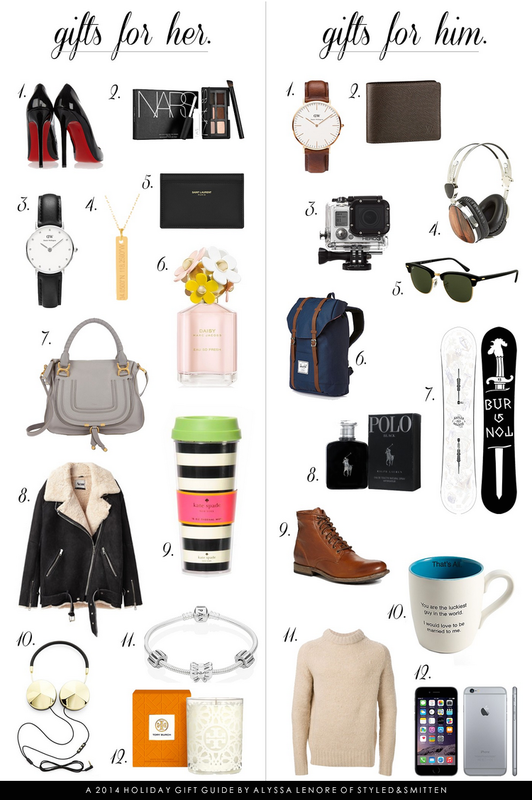 With Black Friday Sales upon us, it's time to release this little holiday gift guide for the 2014 holiday season. Please keep in mind that you can select different variations of each item because this is just for inspirational purposes. You don't have to purchase Christian Louboutin Shoes or a Louis Vuitton Wallet because it may not necessarily be in everyone's budget, but that's okay! If that girl loves shoes, or if that guy really needs a new wallet, there are great deals starting this weekend and I'm sure you'll be able to find a great pair of heels or a high quality leather wallet for a steal! Whether it's for that special guy or girl, a sister, brother, friend, or coworker, I have curated a list of items that will hopefully help you out in this very difficult time of the year. Gift giving! This image map is shopable so if you see something you like, click away! You can also shop my selected pieces at the end of the post with additional links to some really great ideas. Read more to get details about my gift guide, special discounts/promotional codes, Black Friday Sales and so much more. 7 FOR ALL MANKIND: 40% Off Full Price Items with the code "EARLY40"
ALLSAINTS: 20% Off with the code "THANKS"
ANTHROPOLOGIE: They're handing out gift cards to shoppers up to $500 on Friday! This is an in-store deal so make sure you stop by here if you're out and about. ANN TAYLOR: 40% In Store and 50% Online with the code "THANKS"
ANN TAYLOR LOFT: 50% Online with the code "TREAT"
BANANA REPUBLIC: On Friday, before 1PM, you can take 50% off one item or 40% off your entire purchase all day. This is in-store only so you'll have to make a trek outside for this one! DANIEL WELLINGTON: I have teamed up with Daniel Wellington Watches once again and you can get 15% off sitewide on www.danielwellington.com with the code "holiday-alyssalenore" (valid until January 15th) and they're also offering FREE worldwide shipping! I got my watches in 2-3 days! ELECTRONICS: Check out Target and Best Buy for some really great deals. MADEWELL: 25% Off Your Entire Purchase with the code "GIFTON"
PIPERLIME: Extra 40% Off Final Sale Items with the code "EXTRACHIC" by 11/26 and take 25% off with the code "IHEARTNYC" on Friday. SHOESCRIBE: 25% Off Entire Order with the code "CYBER14"
SHU UEMURA: Use "HAPPY125" to take 15% Off purchases over $125 and free shipping. Their eyelash curler is the best. URBAN OUTFITTERS: Urban Outfitters is offering 20% Off with a Valid College, Military, or Urban On ID. ZARA: After 8PM, Zara will begin their Black Friday Sale. Keep an eye out! WEST ELM: 25% Off Entire Purchase with Code "SUPERSALE"